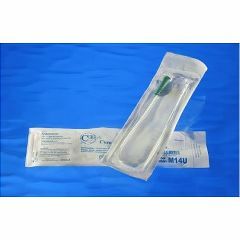 The Cure Medical U Shaped Pocket Intermittent Catheter is a high quality DEHP and latex free product that always has fire polished eyelets that are smooth and less irritating. The U Shaped packaging enables men to discretely carry the product in a pants pocket. 100% latex free! A latex allergy can change a life forever, no more elastic in clothing, no rubber bands. Latex free catheters are a must have. 100% fire polished eyelets on all products, all the time. Fire polished eyelets are smooth and less irritating. Other brands have cold punched eyelets that can cause abrasions. Cure medical believes in nothing less then the best for you. Cure Medical gives 10% back to find a cure for spinal cord injury; it is time for manufacturers to step up. There are many ideas to find a cure, but without funding, nothing will ever happen. Fire-polished eyelets are more gentle to use. See Cure Medicals eyelets versus the competition below! easy to use. economical . easy to use. economical . an excellent comfortable and economical catheter that is easy to use and gets the job done.